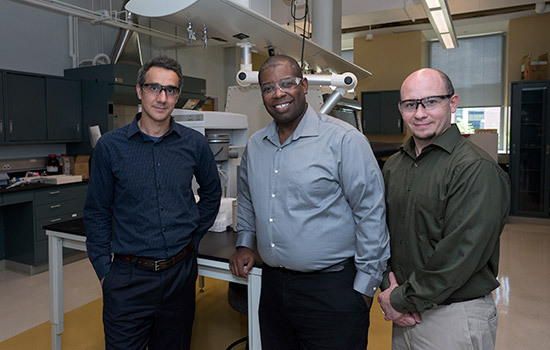 Faculty-researchers Ivan Puchades, left, Reginald Rogers and Brian Landi are working with corporate and government partners to develop nanocarbon-based wires that could replace traditional copper wiring for equipment to impact the longevity and durability of today’s electronic devices. Researchers at Rochester Institute of Technology are working with corporate and government partners to develop more efficient, durable and cost-effective carbon nanotube technology in electronic components and systems that now use copper wiring. RIT researchers won an award of $1 million from the Department of Energy’s (DOE) advanced manufacturing office for “Nanometal-interconnected carbon conductors for advanced electric machines.” Landi is the principal investigator on the project, working with government partners at the U.S. Naval Research Laboratory and industry leaders Nanocomp Technologies and Minnesota Wire. With the implementation of numerous advanced manufacturing initiatives across the U.S., and RIT’s involvement in seven of 14 of them, this DOE project is a parallel effort at the research stage to advance technologies that could be commercialized by the research team’s corporate partners. Bend a copper wire and eventually it breaks. Not so with nanocarbon-based wires, and the physical properties of this new materials technology could impact the longevity and durability of today’s electrical devices. Metal-based wiring such as copper in electric devices many eventually be replaced by nanocarbon materials that are stronger, will not corrode, are lighter in weight and equally conductive. Traditional metal wiring such as copper or aluminum is used in large and small electric devices to connect internal circuits and components that power aircraft and defense or commercial vehicles and equipment. The advantages of nanocarbon wiring over metal wires are in the mechanical properties where the exceptional flexure tolerance and better corrosion stability can extend the life and duty cycles of the wire. Using nanocarbon-based wiring, which is lighter and less dense than copper, could also improve fuel usage and save energy in portable applications such as unmanned aerial or underwater vehicles. “Imagine all those electrical components that need to be replaced in maritime applications because of corrosion over time. If you had a carbon wire that was more tolerant, you wouldn’t have to replace them as often,” said Landi. He and RIT assistant professors Ivan Puchades, of electrical engineering, and Reginald Rogers, of chemical engineering, co-investigators on the project, bring expertise to the team in new chemical and metal materials development, microelectronic engineering and product commercialization. Nanotechnology is the science of materials smaller than a human hair or DNA strand. More than working at that elemental scale, nanotechnology enables scientists to capitalize on the specific physical, chemical, mechanical and optical properties occurring at that scale, according to the U.S. National Nanotechnology Initiative. Nanomaterials such as carbon nanotubes can be combined into structures which can be formed in various shapes or composite materials including different gauge wiring for electrical components. “We are well-positioned to do this with more than a decade of research in carbon nanotube technology, specifically for wires and cables, and we’ve had success over the years as the first to publish carbon nanotube coaxial cables within military specifications. We are continually improving the current-carrying capacity of these carbon nanotube-based wires as well. The differentiator in the present work is, we are looking for the right combination of using carbon nanotubes with nano-metals to create a better transport at the nano-scale. This is going to require us to find the right chemical treatment technology to infiltrate the nano-tube network with metals and the right metals,” said Landi who is also director of the Carbon Conductors & Advanced Battery Group, a team affiliated with RIT’s NanoPower Research Laboratory (NPRL). Puchades and Rogers will focus on various types of electrochemical metal deposition and chemical functions required to achieve nanometal-interconnected carbon conductors, respectively. The team also re-unites with former NPRL and RIT microsystems engineering graduate Cory Cress, a materials research engineer at the U.S. Naval Research Laboratory in Washington, D.C., and co-author on a recently published article in the Journal of Applied Physics about carbon nanotube wires and high-current demands, sponsored by the Office of Naval Research.